Gangotri is situated in the lush green state of Uttarakhand. Know more about travel and tourism to Gangotri, India. 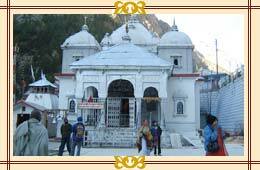 One of the four sites amongst the holiest places, Char Dham in India, is Gangotri. This sacred city is located in the northern part of the state of Uttarakhand. It is known as the source of River Ganges and also the seat of Goddess Ganga. Ducked amidst the sprawling Garhwal hills, Gangotri is an ideal location for all those who wish to take a dip into the oceans of divinity, as well as those have a thirst for adventure. This makes Gangotri an ideal spot in terms of travel and tourism. Gangotri also has a strong historical past and bears the eternal feel of antiquity. According to mythological records, King Bhagirath did penance here, after which, as per Lord Shiva's wishes, River Ganges came down on earth. However, to save the earth from the fierce force of the river, Lord Shiva held her in his locks. Thus, river Ganges is also known as Bhagirathi here. Moreover, it is also believed that Pandavas came down to this place to perform Deva Yajna. As a result, Gangotri is a significant place from religion point of view. Hundreds of devotees throng the place every year in order to unleash the secrets of spirituality. Some of the main attractions of Gangotri include Gangotri Temple, which was built by Gurkha monarch Amar Singh Thapa, around 3000 years back. Another pilgrim site here is Jalamagna Shivalinga, which is a natural rock Shivalinga submerged in the river. It is deemed to be the place where Lord Shiva held Ganga in his locks. This Shivalinga is only visible in winter months. Other worth visiting places in the vicinity are Gaumukh (source of Ganges), Gaumukh Glacier and Nandanvan. Drifting towards the adventurous aspect of Gangotri, it offers a number of sports for fun lovers such as river rafting, trekking etc. Thus, to enjoy the natural beauty and religious fervor at its best, Gangotri is a must visit place for all.